How to turn an old home into a jewel on the block. What do a fashion mogul, a Williams-Sonoma executive, a museum curator, and a design-savvy actress have in common? Good taste, of course, but more than that: a shared passion to "bring back," to carefully restore and artfully embellish, their houses. 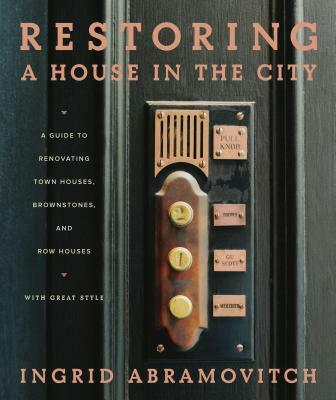 They are among the twenty-one real-life renovations featured in this essential resource—from stately town houses to brownstone fixer-uppers—to give the true experience of creating an urban oasis on any street. Whether hunting for rare chandeliers, salvaging floorboards for new tabletops, or removing walls to let more light in, all the nuts and bolts of restoration are here. In Boston, a young family's renovation takes three years and includes every modern amenity (a media room, home gym, elevator), but saves most of the original interiors (window shutters and seats, marble fireplaces). A Baltimore couple—both stars of the graphic design world—must reconcile their cutting-edge tastes with their traditional surrounds. From furniture and color to rooftops and terraces, Restoring a House in the City offers a treasury of inspiration and ideas, as well as a lavish illustrated tour of some of the best done renovations in the business. "An enticing portfolio of urban houses." "The 21 houses in the book…show what is possible, what is realistic and how much can be done, even on a budget." "This book is worth it for all of the ideas, resources, and wisdom-not to mention great decorating ideas." "From squeaky floors to coal-burning fireplaces, Ingrid Abramovitch's primer shows how to reconcile old urban dwellings' quirks with contemporary tastes through architects and designers' tips and nearly 400 color photos."? "Lavish…The book shows off restored gems from 10 cities, including…town houses belonging to Julianne Moore, Robert Duffy, and Chilean ?designer Maria Cornejo." "More than just a coffee-table book, the 21 houses... serve up all the juicy details…including how long each renovation took, the year the house was purchased and the neighborhood in which it is located."